In spite of James Patterson’s immense popularity, not to mention rumors that his political views tend conservative, I had only tried one of his novels up to now. And I didn’t finish that one. 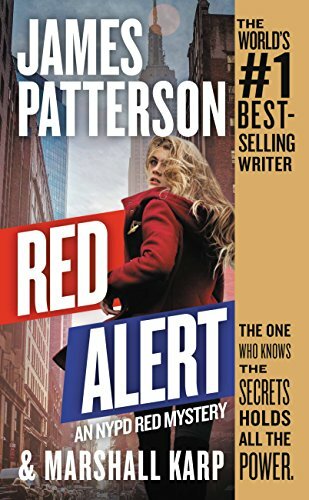 But a friend recently recommended the NYPD Red series, so I figured I’d give Patterson another chance with Red Alert. Alas, he’s just not my cuppatee. Zach Jordan and Kylie MacDonald are the New York Police Department’s “Red Squad.” Their job is to handle threats and crimes involving the city’s rich and elite. So they’re on hand the evening a prominent architect is killed by a shaped charge while giving a speech at the elegant Pierre Hotel. At first the reaction is that such a thing was unthinkable. The man was a do-gooder, part of a foundation devoted to helping the less fortunate. But gradually a different picture emerges. He was one of a group of four men, all rich and powerful, who, years before, had gotten into trouble trying to smuggle drugs from Thailand. When another of the four is killed by a similar explosion, the truth becomes obvious – someone has a grudge against the four of them, and is picking them off one by one. Meanwhile, a female filmmaker is found dead in what appears to be a “strangulation fetish” accident. But it’s not an accident. The story here is told with the competence one expects from an author of James Patterson’s experience and prolific output. But somehow I had trouble caring. The characters seemed to me to have the depth of cardboard. And the heroes were pretty stereotyped – a solid, sensible male cop partnered with a wild and crazy female cop who likes to beat people up, shoot people, and drive fast. I’ve seen that one too often in the last couple decades. So my reaction is that the book is adequate light reading, but it failed to provide the vicarious human element I personally crave. Your mileage may (and likely will) vary. Cautions for language and adult stuff.